When surveys reveal that more than 46% people never buy things online if they are offered to them in a language other than their native one, it makes no sense to delay getting your website localized. Adding another language to your website will help you double your customer reach. However, localization is not just translation; it is much beyond that. This is a fundamental step toward localization; however, many fail to give it the importance it deserves. One should always do a thorough research before finalizing the language that one decides to add to one’s website. This is because globalization has made cities cosmopolitan and one can always find places with a range of linguistic groups. As it is obvious that one cannot incorporate all the languages, one should be clear about the language that would bring the maximum ROI (return on investment). It’s totally possible that a language may be spoken by a large number of people who, nevertheless, may have a low purchasing power. Hence, one should not always look at the numbers, but other indicators too. Imagine you are an American company selling travel plans. You decide to expand your business to the UK and launch a website tailor-made as per British choices, locales, and destinations. Everything about the website is perfect, but you realize there is no traffic. What is “vacation” for Americans is “holiday” for the British. You may be selling a vacation but people could be searching the term “holiday.” This way you will never feature in searches. Hence, you need to be careful with words when you localize. By definition, website localization is all about changing the entire look and feel of a website as per the cultural and religious sensitivities of the people who are targeted. This automatically makes images and symbols crucial. Suppose you are selling your range of designer shoes in the Middle East. And your home page has images of, let’s say, scantily clothed women. Being against the cultural sensibilities of the people, the images may increase your website’s bounce rate. So, always choose pics that are in sync with your target audience in a particular region. To sum it up, your one-point agenda for website localization should be to put yourself in the shoes of your customer and then have a look at your website. 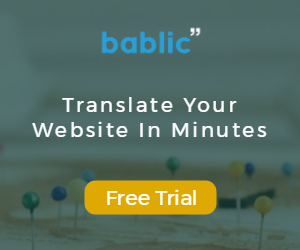 If you are planning to localize your website, Bablic is one tool that will help you change text, manually edit words, replace images and videos, and modify style and CSS issues, all at the same time.